Should I Rent a Golf Cart in Placencia, Belize? It’s easy to see why the Placencia Peninsula is such a popular destination for visitors. Bordered on one side by a lovely, mangrove-lined lagoon and on the other by the shimmering waters of the Caribbean, the Placencia Peninsula is one of the most beautiful locations in the country. And there’s no better way to get around Placencia than with a golf cart. Barefoot Services and Rentals has four-seater golf carts for rent on an hourly, daily, weekly, or even monthly basis. With a golf cart, it’s easy to zip around to all the attractions. In fact, many people say you haven’t had the pleasure of a real Placencia experience unless you see it from behind the wheel of a golf cart! Golf carts move at a nice, steady pace, perfect for visitors who want to soak in all the sights and sounds that Placencia has to offer. You can get a real taste of village life when you use a golf cart to enjoy a meal at a restaurant, do a bit of shopping, tour an art gallery, explore different neighborhoods, or zip over to your favorite beach bar for a drink. Best of all, with a golf cart, you never have to worry about navigating streets in an unfamiliar country because you’ll be moving at a nice, easy pace. You can also head up the peninsula to explore villages like Seine Bight or find your own private stretch of beach. The choice is always up to you when you have a golf cart! Golf carts aren’t for people in a hurry, but they’re absolutely perfect when all you want to do is get around. Golf carts are also a lot more fuel efficient than cars, an important consideration in a country like Belize where gasoline is quite expensive (around $5 a gallon). As long as you’re 21 years old or older, you can rent a golf cart in Belize. Prices start at just $49 per day or two hours for $25. Barefoot Rentals and Services is much more than just a vehicle rental company. We also organize adventure tours to the Belize Barrier Reef and different nature parks in the area. 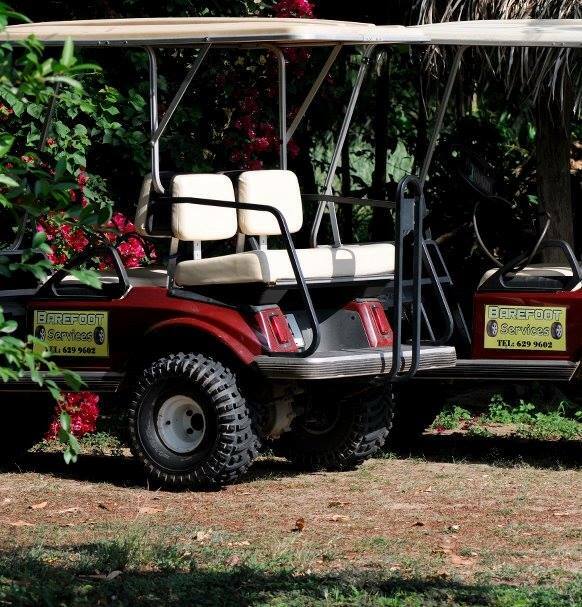 On your next vacation in Placencia, rent your golf cart from Barefoot Services and Rentals!